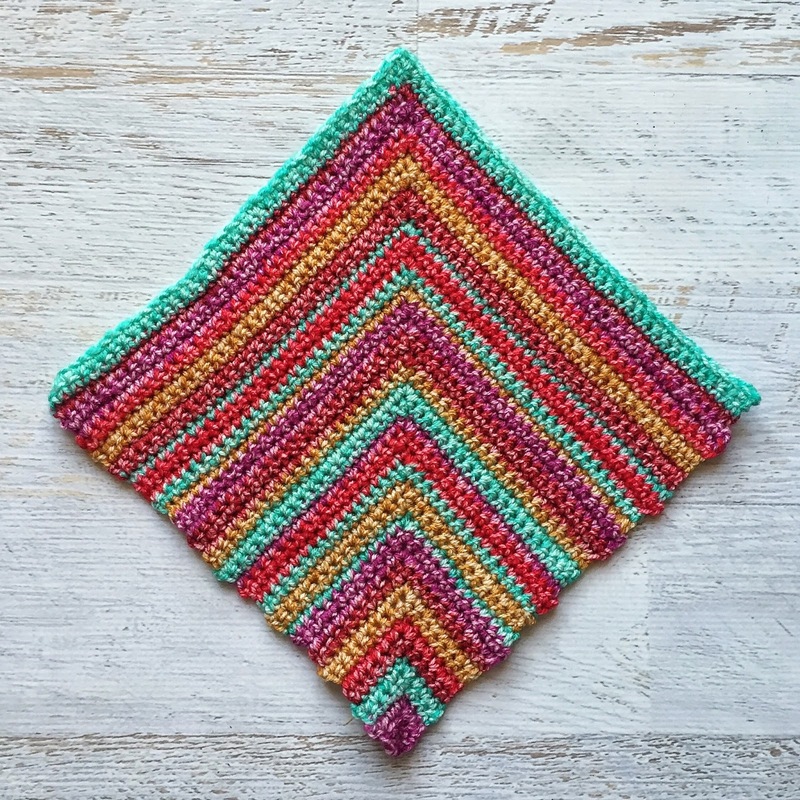 Fifty Shades of 4 Ply: Carnival Cushion - Free Pattern! 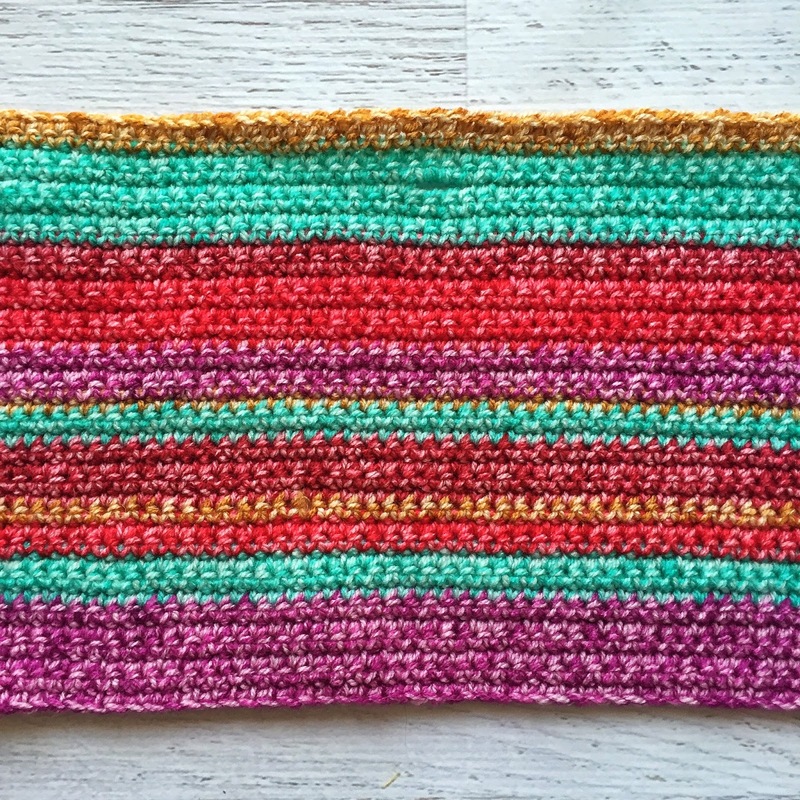 Carnival Cushion - Free Pattern! Ok so it's a little much later than anticipated but Dad has been sick again.... Anyway! 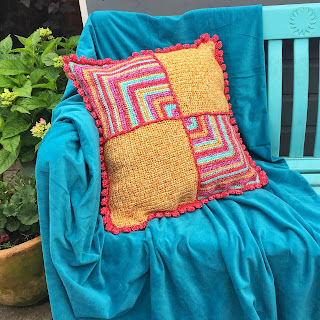 Today I'm sharing the free pattern for my Carnival Cushion! and rows of double crochet stripes to make the back section. 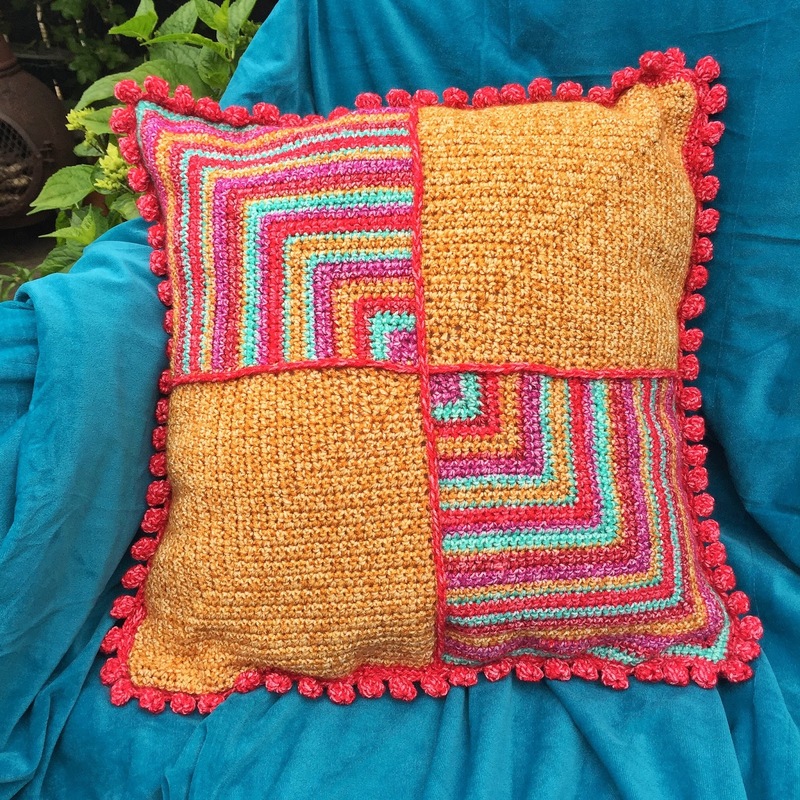 A little surface crochet and a pom pom edging give the cushion a nice finish. 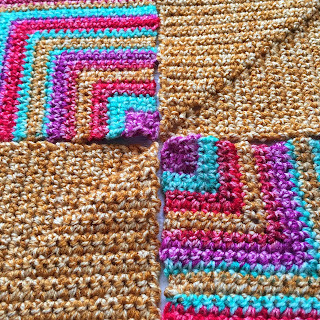 I'm not doing a step by step tutorial for this cushion (time has not been on my side recently!) 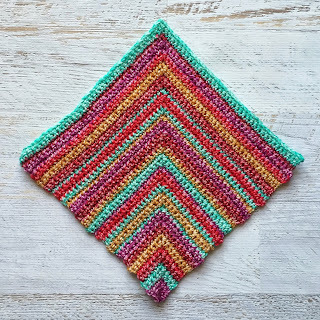 so I'm presuming you have a little basic crochet knowledge. 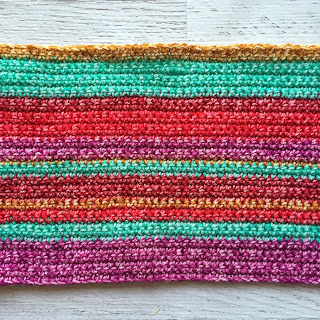 This isn't a difficult pattern but the pom pom edging can be a little fiddly until you get the hang of it! 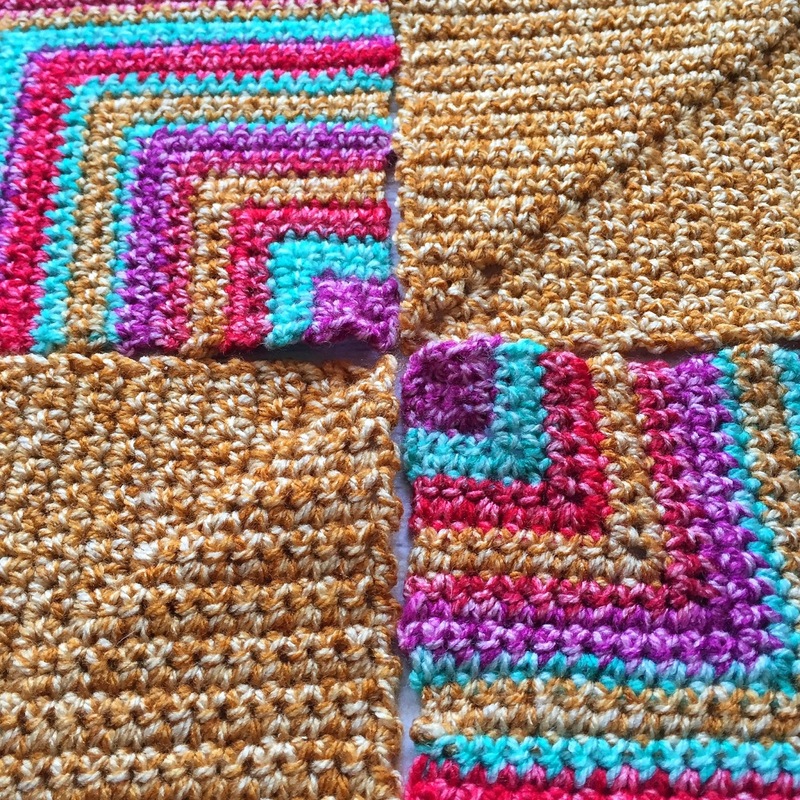 The pattern is written in UK crochet terms. 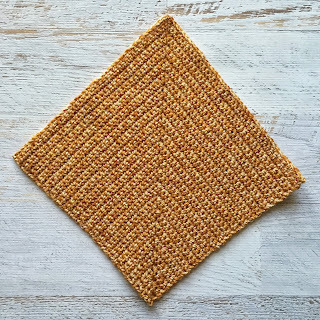 Make 2 mitred squares as above but work in stripes as follows, fastening off and joining in a new colour as needed: Foundation, row 1 & 2 - E Rows 3 & 4 - A Row 5 - D Row 6 - C Rows 7 & 8 - B Row 9 - D Rows 10 & 11 - E Row 12 - A Rows 13 & 14 - B Row 15 - A Rows 16 & 17 - C Row 18 - E Rows 19 & 20 - A Row 21 - B Rows 22 &23 - D Rows 24 & 25 - E Row 26 - B Row 27 - A Row 28 & 29 - C Row 30 - A Rows 31 & 32 - D Row 33 & 34 - B Row 35 - C Rows 36 & 37 - E Row 38 - D Rows 39 & 40 - A Weave in ends. Rows 1-7: D Rows 8-10: A Row 11: C Rows 12-13: B Row 14: C Rows 15-18: E Rows 19-21: D Rows 22-25: A Row 26: B Rows 27-29: C Rows 30-31: D Rows 32-33: B Row 34: A Rows 35-38: E Rows 39-40: A Rows 41-42: C Row 43: D Row 44: B Rows 45-48: A Rows 49-51: D Rows 52-54: C Fasten off and weave in ends. Rows 1-5: E Rows 6-8: A Rows 9-10: C Row 11: B Rows 12-15: D Rows 16-17: A Row 18: B Rows 19-22: E Rows 23-27: C Rows 28-29: D Rows 30-32: A Row 33: A - Buttonhole row - dc10, ch3, sk3, dc21, ch3, sk3, dc21, ch3, sk3, dc10 Row 34: A Rows 35-36: B Fasten and weave in ends. 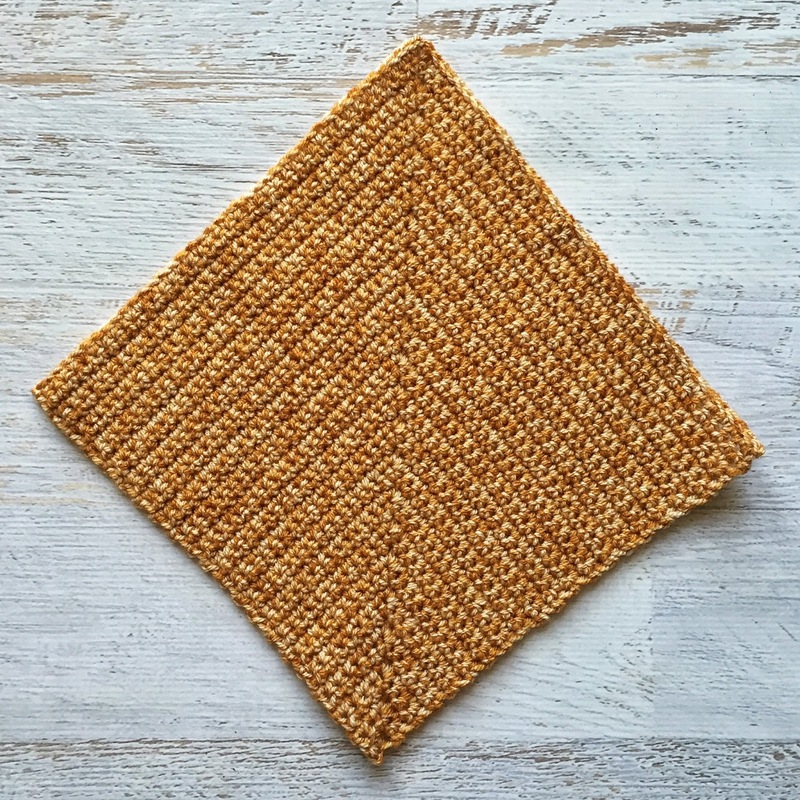 To join the 2 pieces lay them smaller section on top to form a square (measure the edges to ensure you have a square shape) and pin the section where the 2 pieces overlap. With Yarn C join at any point and work a border of double crochet working through both pieces where the sections overlap and working 3 dc in each corner. Work another 2 rows of border in dc as before. Joining the back and front. With wrong sides facing each other and with the back of the cushion facing you join the two pieces together using double crochet and Yarn C. You made have to fudge a little to get even stitches along all 4 sides! I would recommend pinning the pieces evenly together to get an even finish. The pom pom edging I modified from this lovely blog. There is a wonderful step by step tutorial! I wanted my pom poms to sit snuggly around the cushion edge, so instead of working 6 chains I worked 3 chains So start with a double crochet, chain 3 and work the pom pom into the double crochet. In between each pom pom I worked 3 chains, skipped 3 stitches and worked the pom pom into the next double crochet. Before you start I need to point out that the pom pom has a back and a front! Sew on your button and add the cushion pad. Your cushion is completed!!!! Enjoy! So sorry to hear about your father. Hopefully he is getting better soon. 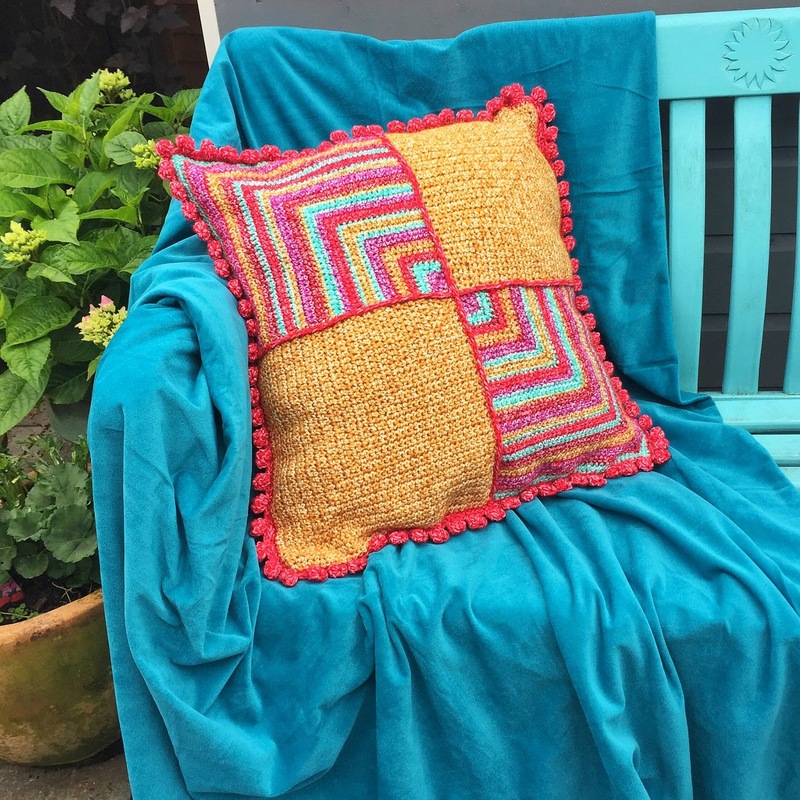 Thanks for sharing the pattern for this beautiful cushion.